An interesting and very different movie, this one, like the movie Locke, strives on it’s limited character mobility and seeing how much it can get out of that kind of situation. An okay movie that could have and should have been a whole lot better. The premise is great. A man wakes up in a coffin, buried under ground, and has no idea what he’s doing there. He has a cell phone and is able to make calls to find out about his situation and find people who can help him get out. That’s pretty much where the storyline ends. Instead of being loaded up with conflicts that need to be resolved over the phone, this film really only has the one conflict of getting Paul Conroy out of the box. There is no mystery here, as to who put him in the coffin, and why. That’s a mistake. Another one is that Conroy really doesn’t speak to any characters from his life, but instead spends his time either on the phone with the negotiator or with the terrorist. Still, it’s definitely an interesting and entertaining film. Just not half as good as Locke, the Tom Hardy movie that actually tried to do something like this and got it right! 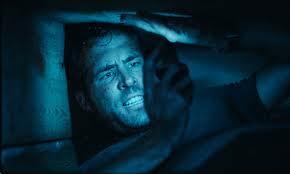 Buried is a Ryan Reynolds movie about a man trapped inside of a box. That box happens to be a coffin, buried six feet under the ground, with the main character, Paul Conroy, (Reynolds,) still very much alive. Based on this premise, you would think the movie would be a mystery, with Conroy determined to figure out who put him in the coffin and why. As it happens, that element is only a very tiny part of the story. He was put there by terrorists, plain and simple. There’s no bigger mystery or answer than that. There’s no conspiracy here, or characters who he trusted that betrayed him and led to this. All the usual elements that would drive a plot further along are left out of this one, and yet, still, the movie does find ways to hold our attention. For that it deserves a lot of credit. A few years after this movie, actor Tom Hardy came out with a film called Locke. That movie was simply about a man driving around in his car during the course of one night. He never got out of the car, and the movie never left his side. Like Buried, the film featured only one character that we ever got to see, but plenty of others that we got to hear, over the phone. So both movies were about dialogue and not actions. Locke turned out to be an amazing film, whereas Buried actually leaves a good deal to be desired. The reason for this difference is because Locke has multiple story lines and conflicts that all need to be resolved at once. The character is dealing with all kinds of issues during the course of the one night. In Buried, the content of the phone calls seem to all be centered around the same thing. Getting out of the box. At no point, for example, do these conversations address anything from Conroy’s past, and relationships that he might have had with people. That, right there, is a fundamental difference between the two movies. 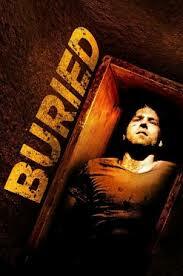 Buried begins with Conroy waking up in the coffin. He flips on a lighter and right away knows where he is and starts panicking. Somehow a character in this situation always manages to have a lighter, (I am reminded of Keifer Sutherland in the remake of The Vanishing.) Conroy grabs his phone and starts calling people. All he gets is answering machines. So he starts leaving messages that just say to call him back. I’m surprise he gets any reception down there at all. One thing pretty cool about this movie is that it does show us the battery bars on the top of the cell phone screen to let us know how charged Conroy’s phone is and how much power he has left. I’m glad when a movie addresses realistic problems like that. And the reception issue might be unrealistic, but how else could they have made this movie? He needed to able to talk to people on the phone in order for the film to have any chance of working. Conroy then decides to call the FBI. He dials information for this number and they need to know what city. He tells them any city and they give him a hard time, saying he needs to be specific. At that point, Conroy just shouts out, “Chicago,” and they connect him. Once on the phone with someone from the FBI, Conroy tells his story. This is the first time we really get to hear it. Conroy was a truck driver over in Iraq. He doesn’t live there, and was simply there to do a job and get materials from one place to another. That’s when the whole group of trucks he was traveling with got hit by gunfire. The next thing Conroy knows, he’s buried under ground. The FBI man tells Conroy to stay calm and that they will get him out of there, only the man doesn’t really seem so sure or believable. Then Conroy gets a call from the terrorist who put him there. We realize that the phone is not actually his. It belongs to the terrorist and was left with Conroy on purpose. There are things that they want him to do from inside of the coffin. First, the terrorist demands that he gets a large sum of money. The terrorist tells him to call whoever he needs to and to get the money as ransom. Conroy tells him that’s impossible. Nobody he knows has that kind of money. Then the terrorist has another idea. He wants Conroy to make a video. This video should be something where Conroy is begging for his life, explaining his situation, and giving the terrorists something they can play on American air waves. Before he makes the video, Conroy gets a call from the anti-terrorism negotiator over there in Iraq. This man tells Conroy that he’s on the case, and knows all about his situation. He tries to instill confidence and hope into Conroy, only Conroy’s not buying it. He asks the negotiator how many people he has saved and the negotiator seems to have a hard time with this conversation. Reynolds asks about some of the past rescue missions, and he asks the man to name one of the people that he helped. The negotiator does, and Ryan looks it up. With the only conversations really being between Conroy and the negotiator and Conroy and the terrorist, things start to go sour by around the halfway point. The premise just starts to get a little tiring, with nothing new being offered up. It’s at about this point that a snake starts crawling out of Conroy’s pants. How the snake got there, I have no idea. Clearly it is a plot device to help liven things up a little, but no explanation for it is given. Conroy gets his lighter up and decides to burn the snake. Genius idea when you’re inside a wooden box. He starts a fire. The whole thing is ridiculous. The fire does scare the snake away, and it finds a tiny hole in the side of the coffin to crawl out of. I was hoping this would lead to Conroy using the hole to start digging. No such luck. And he has to use some liquid, which he conveniently has, to put out the fire he started. One of the most interesting calls that comes in arrives in the second half of the movie from Conroy’s trucking company. At first, the call seems to be about whether or not Conroy knew the risk of being attacked when he went over there. Conroy insists that the company told him the truck drivers would have bullet-proof glass and had nothing to be afraid of. That’s when the company representative pulls the rug out from under Conroy. He tells Conroy that the very morning this happened, before the attack took place, Conroy was let go by the company. He says the reason is because Conroy was having an affair with a coworker. Conroy was never informed that he was let go, of course, but this news conveniently frees the company from having to pay any life insurance money to Conroy’s wife. It’s phonecalls like this that make the movie compelling. If only there were a little more of them. What Locke did that was so brilliant is it had a bunch of conflicts that all needed to be resolved over the phone. Buried really has only one. It doesn’t have many characters, the way Locke did, and seems to be holding back, saving it’s cards for the end, when it should be playing them throughout the movie. I am specifically talking about the people from Conroy’s life that he gets to speak to over the phone. Whereas Locke was loaded with these characters, Buried really has none. Everyone who Conroy speaks to over the phone is somebody that he is speaking to for the very first time, and has never actually met before. That’s a mistake. Buried is a movie that does work, only not quite as well as it should have. Ryan Reynolds deserves a lot of credit, carrying this movie on his shoulders. He is the only actor in the film, of course, but that sort of thing happens a lot these days, from Cast Away to Moon to The Martian. Those are all survival films where one man is left by himself in a remote location. No film, however, not even Locke, has the same level of limited resources and space that Buried does. The ending isn’t as compelling as it should have been and I suppose that’s a big part of the problem. The movie doesn’t seem to lead anywhere. Many of the conversations are interesting, and the premise here is cool, but the movie does not live up to its potential.